The view west across the Hudson River from the top of the trail on Breakneck Ridge. The well-known Breakneck Ridge rock scramble trail will stay open until at least sometime in April, and Metro-North will continue to serve the Breakneck Ridge trailhead for at least the same period. This is a change from the earlier plan to close the trail and suspend train service beginning on January 1, in order to begin construction on the Breakneck Connector project, which would make rail and motor vehicle access improvements to the Breakneck Ridge trailhead as part of the Hudson Highlands Fjord Trail project. The Fjord Trail project itself aims to create a multi-use trail between Cold Spring and Beacon, and the name Breakneck Connector refers to a new path along the Hudson River at Breakneck that would be one of the links forming that larger trail. In December, the Steering Committee of the Fjord Trail met and agreed to reverse the original plan and instead keep the Breakneck Ridge rock scramble open for hikers until at least sometime in April 2018. The Steering Committee works to develop a plan for the multi-use path and recreation infrastructure improvements of the Fjord Trail that incorporates the perspectives of the many entities that have a stake in those plans. The delay comes because of an unsuccessful bid process in the fall. Only one construction firm submitted a bid to the Town of Fishkill by the October 10 deadline, and that bid exceeded the Breakneck Connector budget. The committee is now also considering modifications to Breakneck Connector in order to achieve a better result for the new bid process. Members of the Steering Committee said it was too soon to describe the changes to the plan or the new timeline, however. "The timing is totally up in the air still, based on the bid process for construction of the Fjord Trail project. It could be the spring. It could be the summer even. We don't know,” New York-New Jersey Trail Conference Senior Program Coordinator Hank Osborn said. "We are looking at ways we might alter the design that might reduce the cost, while still achieving all the goals of the project," Scenic Hudson Senior Planner Amy Kacala said. Breakneck Ridge is among the most popular hikes in the region. Osborn believes that Bear Mountain and Breakneck Ridge are the two most popular hikes in the region, with headcounts of hikers at both locations on Saturdays and Sundays during the peak seasons of 2017 establishing Breakneck as the more popular of the two – 50,288 ascending the Breakneck Ridge rock scramble vs. 28,566 hikers at Bear Mountain (though visitor counts stopped a few weeks earlier at Bear Mountain). Osborn also says that Breakneck is by far the most searched hike on the NY-NJ Trail Conference website. And, each year Trails.com analyzes trail downloads, ratings, and page views, and currently gives Breakneck Ridge the number one rating among 60,000 hikes throughout North America based on this data. 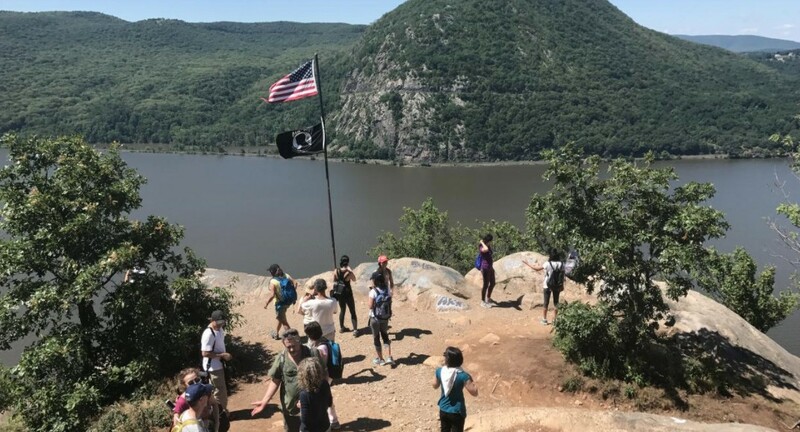 Breakneck’s popularity is likely due to the combination of train access from New York City, the rock scramble that requires the use of hands at times while hiking, and the views of the Hudson River and Storm King Mountain across the river from multiple points along the ascending trail. The original Breakneck Connector design includes new train platforms for the train stop that serves the trailhead, an ADA-compliant pedestrian overpass for that train stop, paving the existing parking lot and formalizing parking spaces along Route 9D as that road approaches the trailhead. Plans also include a small wooden structure at the trailhead itself, serving as a welcome station. There are also measures aimed at safety, including a trail between the train station and the trailhead so that hikers would not have to walk on the shoulder along Route 9D, and reserved parking for emergency vehicles for improved emergency response for hikers in distress. "The main improvement will be safety. It will get people out of 9D, off the road. Parking will be safer. People will no longer need to walk in 9D," Osborn said. Osborn has overseen the NY-NJ Trail Conference's Trail and Summit Stewards Program that has staffed Breakneck Ridge trailhead at busy times in recent years, conducting visitor counts, and checking in with hikers before they attempt the steep rock scramble, in order to ensure that they are prepared to enjoy the trail. Many parties have been part of the plans. Since the Catskill Aqueduct crosses 1,100 feet beneath Hudson River at Breakneck Ridge, on its way to bring drinking water to New York City, the Department of Environmental Protection is represented on the Fjord Trail Steering Committee. Breakneck Ridge itself is also located at the boundary of the towns of Fishkill (which includes Beacon) and Philipstown (which includes Cold Spring), so both towns are part of the committee, as well as the City of Beacon and the Village of Cold Spring. And, although the Breakneck Ridge train station is within the Town of Fishkill, construction is planned on property owned by Metro-North and the Department of Transportation, so each of these entities is on the Steering Committee. The committee also includes the Department of Conservation (of New York State), and the not-for-profits, Scenic Hudson, the New-York-New-Jersey Trail Conference, and the Hudson Highlands Land Trust. Plans for the trail will also affect the many hikers who come to Breakneck from throughout the region. Based on the Saturday and Sunday peak-season visitor counts conducted since 2013, the New-York-New-Jersey Trail Conference estimates that week-round about 100,000 total people hike Breakneck throughout the year, with about one-third arriving by train. Because of train service to the trailhead, Breakneck is accessible to hikers who don’t have cars. It's not known exactly when trains first started stopping at Breakneck Ridge for hikers, but the existing pedestrian overpass, which would be replaced in the original Breakneck Connector design, once had a date plate reading 1911, according to local historian Thom Johnson. Johnson also related a story he was told that this overpass was originally constructed by the New York Central Railroad to discourage Francis Bannerman VI from continuing in his practice of having his workers carry goods over the train tracks en route to his property, Pollepel Island. Hikers have been using that piece of infrastructure to access the southbound train service at Breakneck Ridge for decades. Despite plans to temporarily suspend train service sometime during or after April, Metro-North recently increased service to the trailhead to match greater numbers choosing to take the train to Breakneck. In December, Scenic Hudson learned that an additional $200,000 state grant was awarded for Breakneck Connector. The application was submitted in July 2017 through a New York State consolidated funding application (CFA). Funding for the project now includes four state grants totaling $1,035,000, as well as millions of dollars in private funding, according to Kacala. New York State Parks also plans to undertake a companion project at the same time with separate funding, which would construct stone steps at the very beginning of Breakneck Ridge trail, before hikers reach the rock scramble itself.